With Austin’s zealous housing market, surging population and current questionable water supply, we realize that it may not be feasible for us to be able to return to the city we love and have called home for the last 26 years. We’d heard good things of Asheville for some time, so scheduled an entire week there in order to be able to thoroughly check the area out and get a feel for the city as a potential place to settle once we decide to do so. We quickly found out from locals that we are not the only couple considering Asheville as a future place to settle. The rumor is that President Obama has bought property and plans to move his family there upon leaving office. While newspaper reports state that the White House is denying such a purchase, the people of Asheville continue to think otherwise. 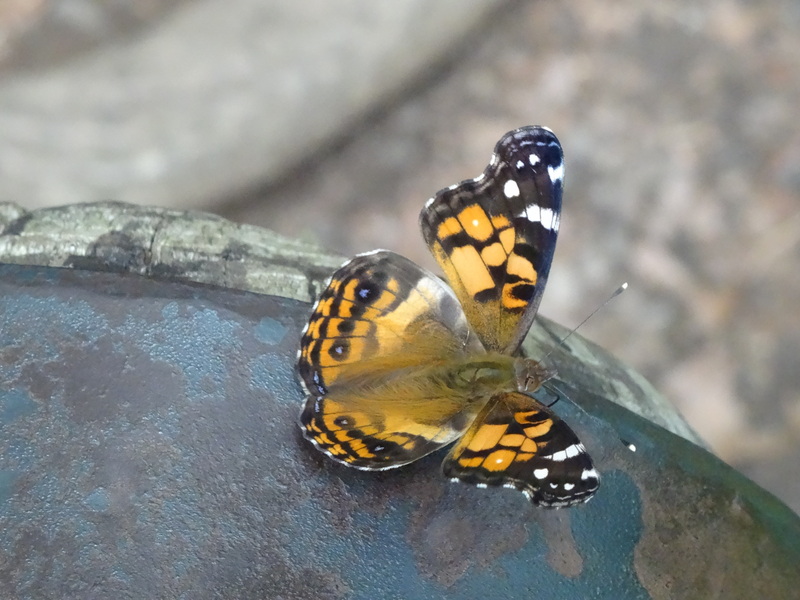 Asheville is definitely laid back, slower paced than Austin, and lacks the traffic issues. We thoroughly enjoyed our time there, particularly the easy access to the seemingly infinite options of outdoor activities. 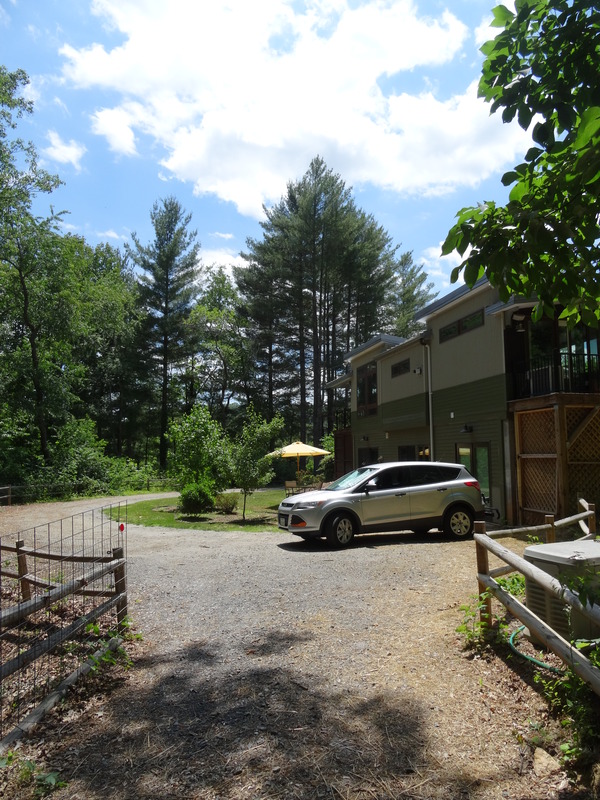 We stayed just outside of the city in an “eco” cottage located just off of the Blue Ridge Parkway. Country living for the week was a welcomed change after staying in the city centers of New Orleans and Atlanta. 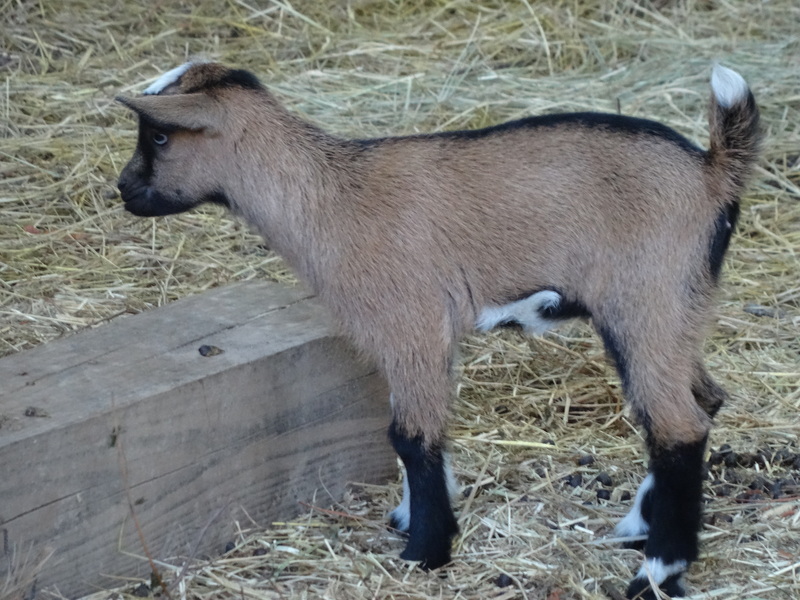 We awoke with the sun each morning and to the sounds of chickadees, woodpeckers and goats. The easy pace of Asheville took hold of us immediately as our first full day was spent strolling through artists working studios in the city’s River Arts Districts and enjoying the funky culture and food of West Asheville, which was reminiscent of that of Austin’s South Congress 10-15 years ago. 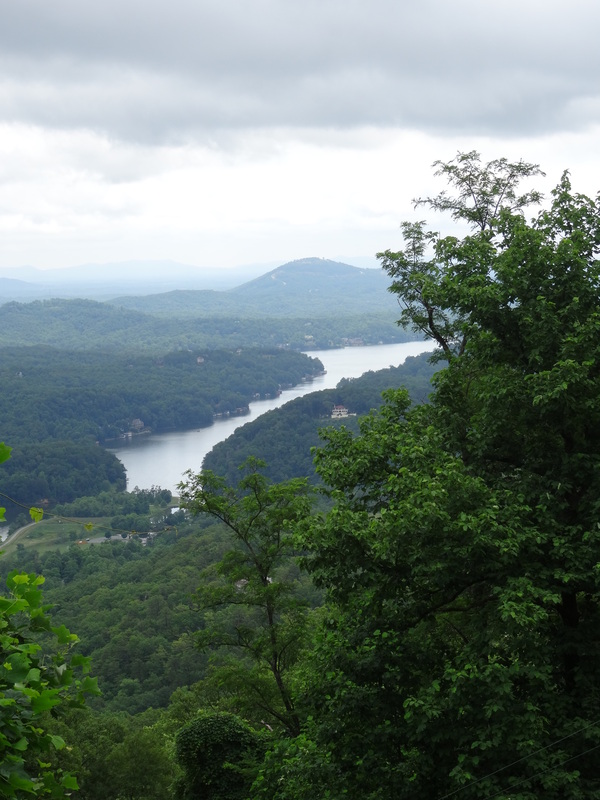 However, the bulk of our time was spent enjoying the gorgeous landscapes, winding mountain roads, and some of the numerous hiking trails, rivers and lakes that surround Asheville. 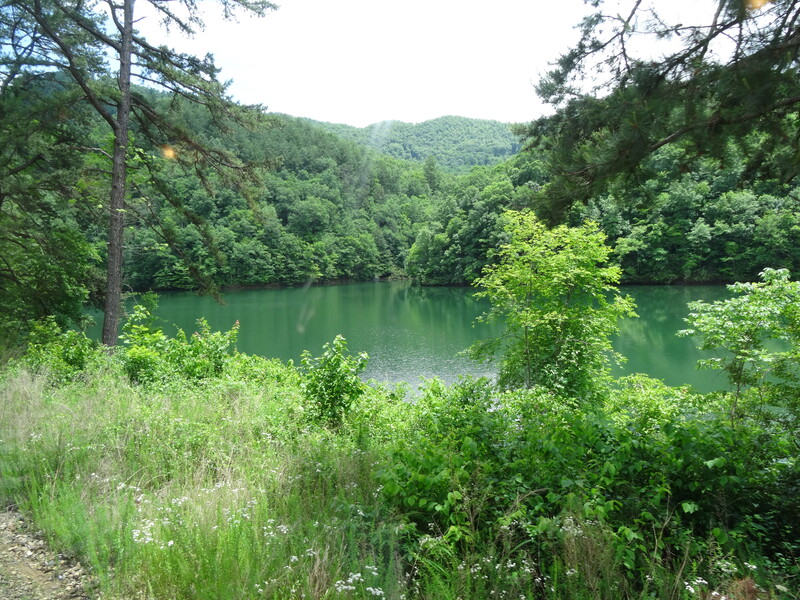 Located about 25 miles southeast of Asheville, this is a beautifully maintained state park that offers tremendous views of the Blue Ridge Mountains. 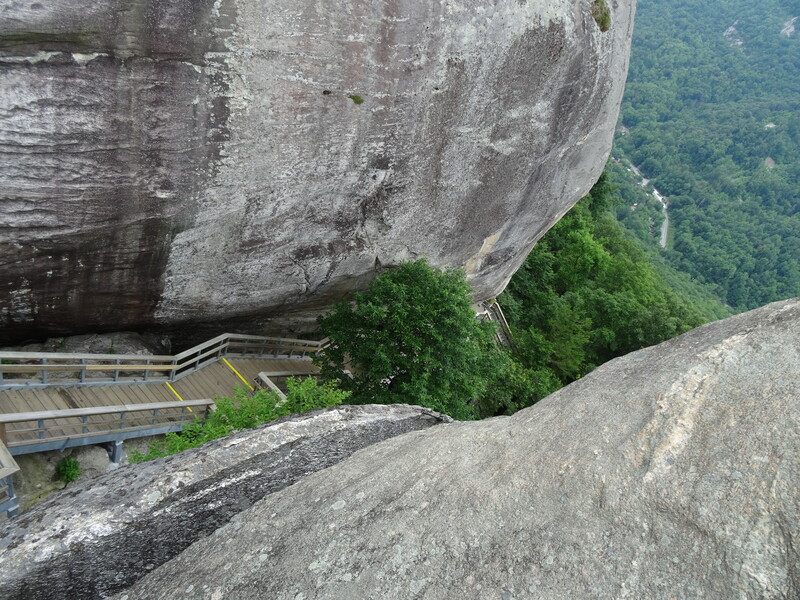 We trekked the 491 steps to the top of the park’s namesake rock, followed by a short hike to Hickory Nut Falls. 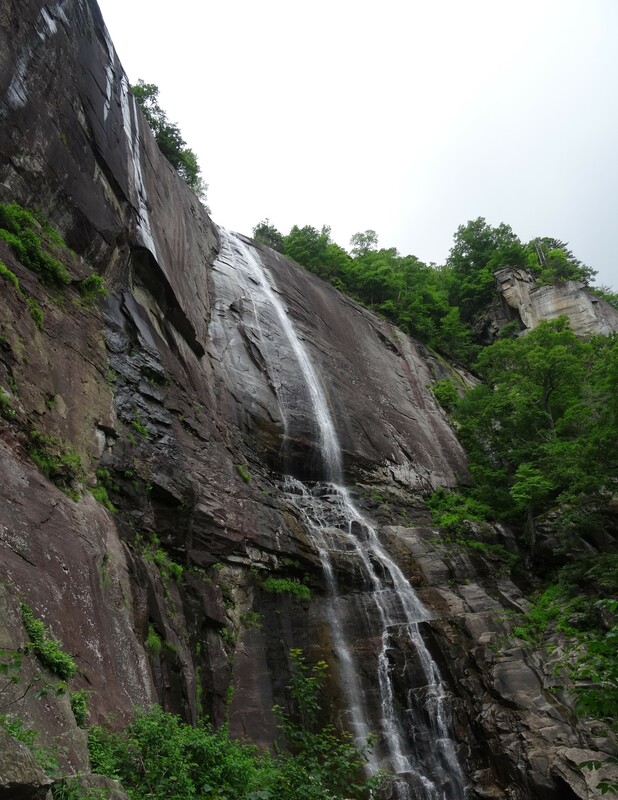 The falls is featured in the movie, The Last of the Mohicans, which we have yet to see. 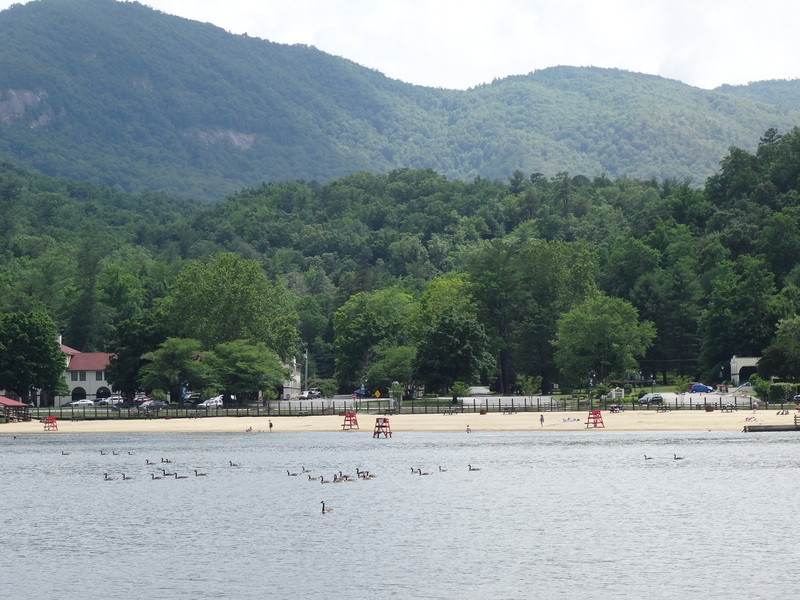 Just beyond Chimney Rock lies Lake Lure, a quaint to upscale community in a narrow valley on a southern inlet of the mountain lake of the same name. We took time to walk the footpath along the waterfront, where we watched boats loaded with tourists head out to and in from the main part of the lake, chatted with locals fishing, and admired the lakefront houses. 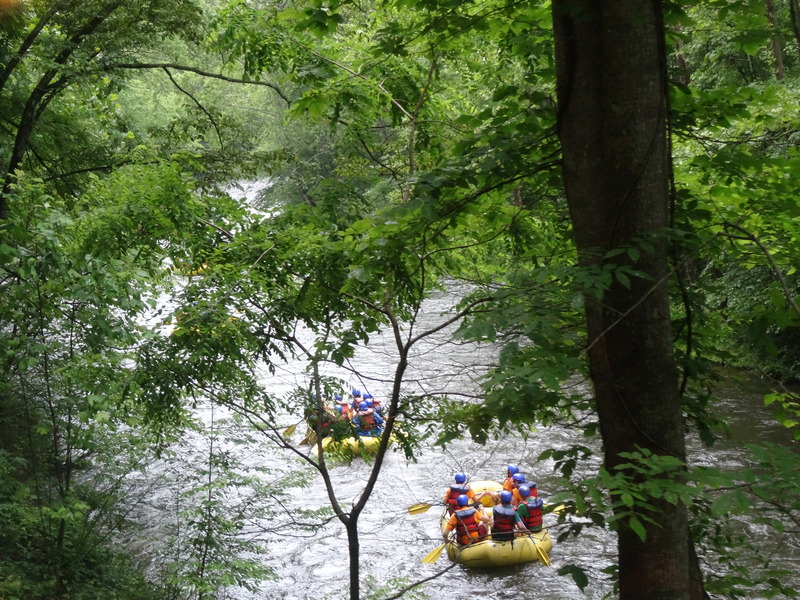 The Nantahala offers some of the best rafting in the area and normally we would have partaken in such activity, but being less than three weeks since breaking my ankle, we instead opted to enjoy the river by train. 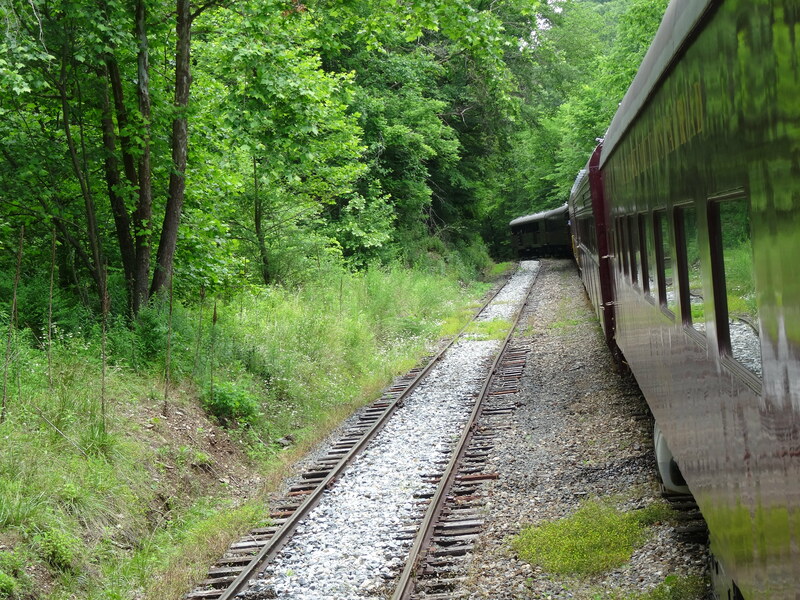 The Great Smoky Mountains Railroad departs from Bryson City, North Carolina, which is 68 miles west of Asheville. We arrived in the city early with the intention of eating breakfast before catching the train. Yelp offered reviews of several restaurants, but we choose the Everett Street Diner because of the local police cars and five Harley Davidsons that were parked outside its entrance. Outside of New Orleans, it offered the best breakfast we’d had to date, and it was certainly the best price. 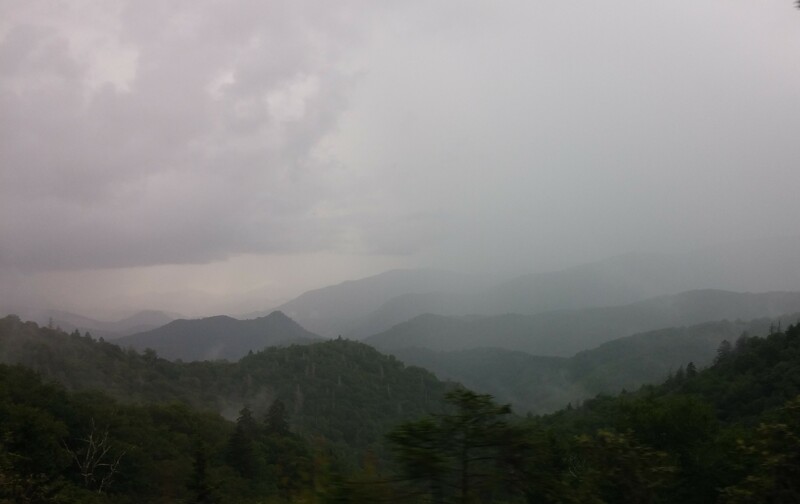 The 4 hour round trip train ride wound through narrow passages, crossing the Appalachian Trail and Lake Fontana (which is a dull murky green color due to the copper deposits at its bottom), and along the Nantahala River. 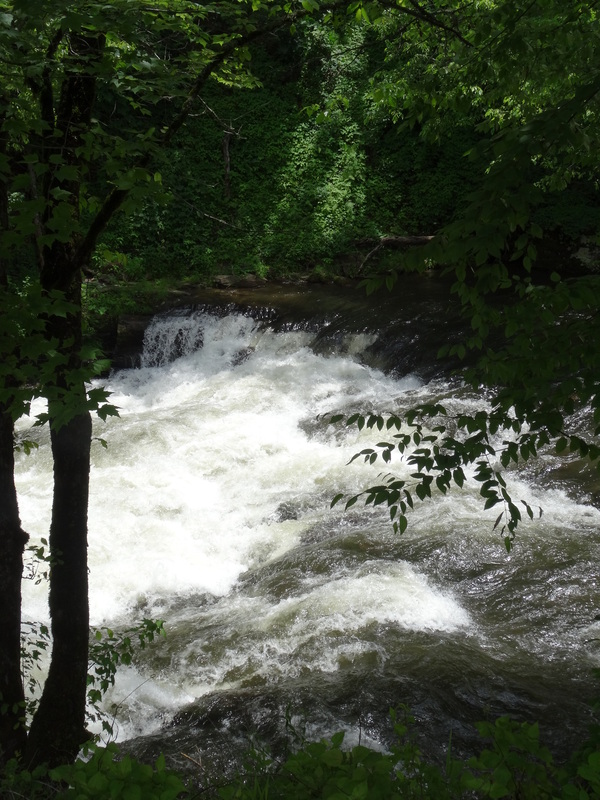 The river’s most challenging rapids are along the Nantahala Outdoor Center where the 2013 U.S. Olympic kayak freestyle team trained. 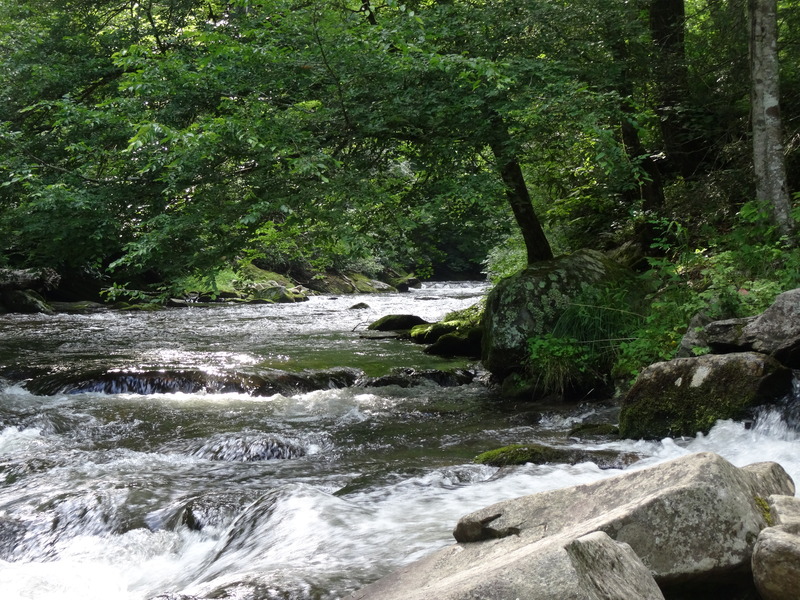 We also found it interesting that the water flows along this section of the Nantahala are slowed to a trickle each evening by an upstream dam. Trey spotted a national park sign as we were leaving Bryson City and decided to follow it. Stumbling across the Deep Creek area of the park was a great addition to what was already a full day. 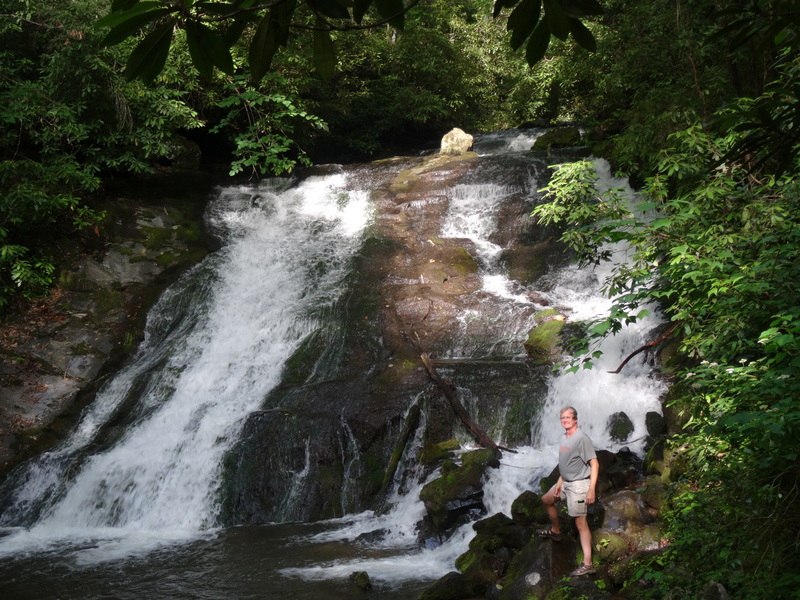 We followed two of the three trailheads accessible from the parking lot and leading to separate waterfalls. We also loved watching the tubers navigate through the creek’s rocks and currents and found ourselves wishing that we had our bicycles to further explore the parks paved pathways. We did end up returning to the park with our bikes later in the week. 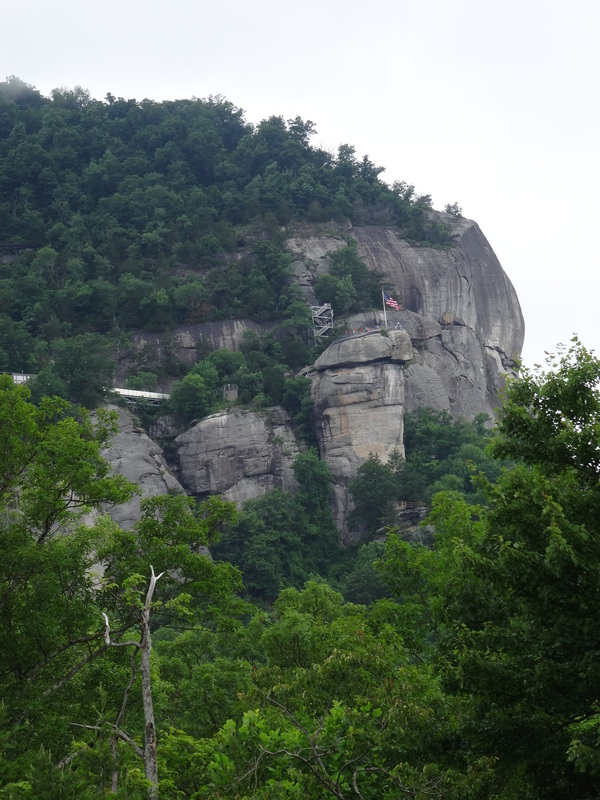 Upon finally leaving the Bryson City area, we decided to loop 10 miles out of our way to check out Cherokee, North Carolina, despite plans to visit it the coming weekend. It is the headquarters of the Eastern Band of Cherokees – the band of Cherokees that broke with the Cherokee Nation prior to removal (The Trail of Tears). We simply drove through the city and made mental notes of places we wanted to visit on our return. 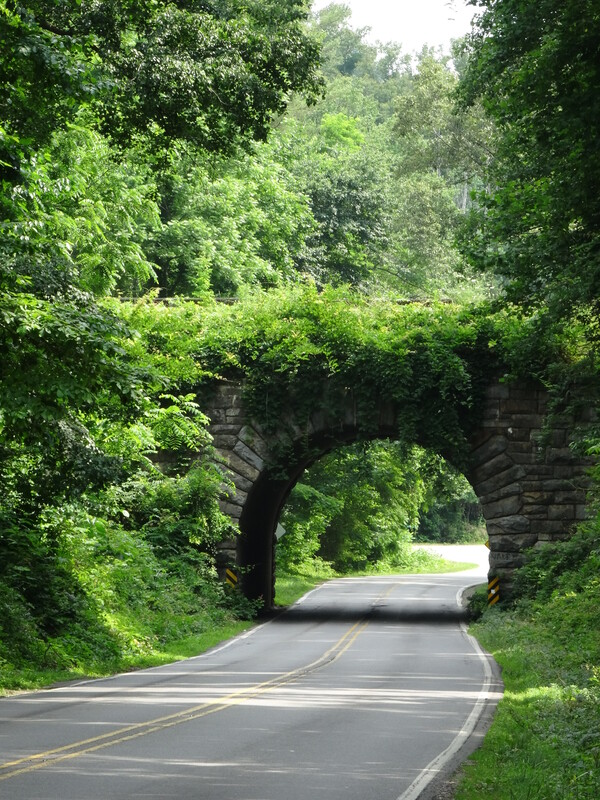 I had recalled that Cherokee was the western end of the Blue Ridge Parkway, the 469 limited access national park road that cuts through and along the top of the Blue Ridge range of the Appalachian Mountains from eastern North Carolina to northwestern Virginia. 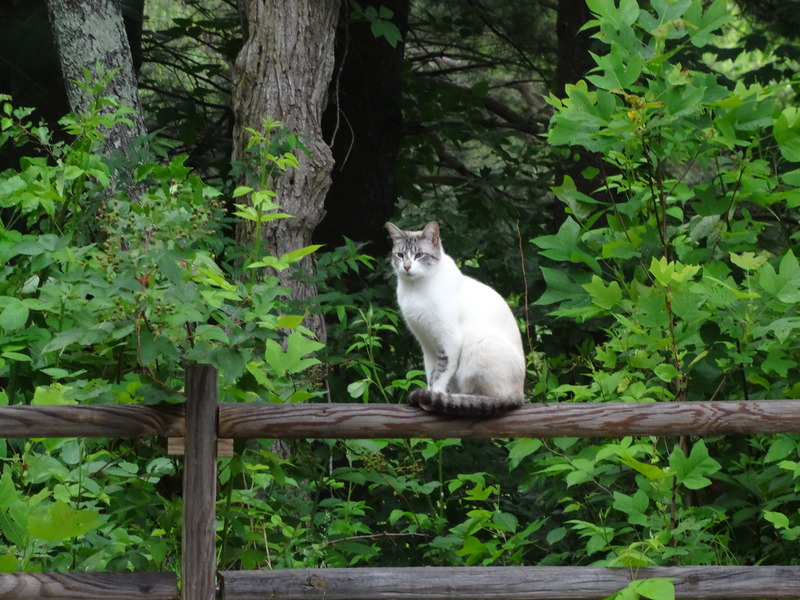 Since a quick check on Google maps showed that returning to Asheville via the Blue Ridge Parkway would add only 16 miles to our trip, we decided to do such that and add to the day’s adventures. 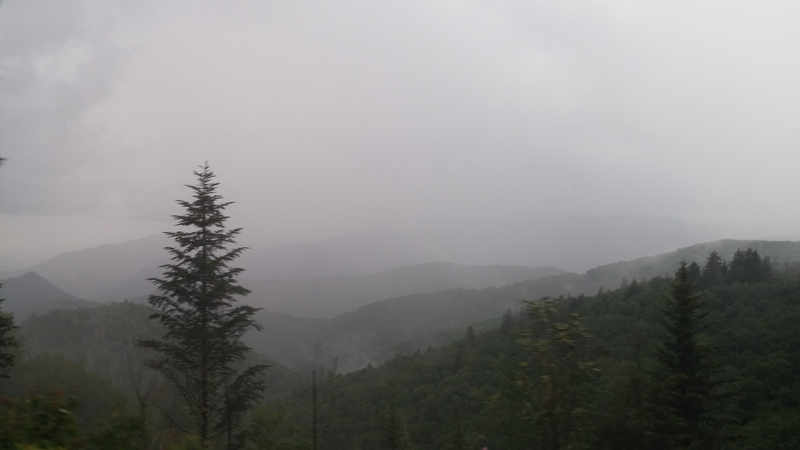 Light rain started falling as we entered the parkway at milepost 469, and fell off and on at varying strengths throughout the three hour drive limiting the vistas, but not to the extent that we were not completely impressed and in awe of the surrounding beauty. However, the clouds that sat at higher elevations kept our eyes keenly focused on the only thing visible – the road’s stripes keeping us in our lane. Despite the occasional nervousness of the drive we foraged through bypassing several opportunities to escape to the lower elevations of state and interstate highways, arriving safely back in Asheville as the sun set. 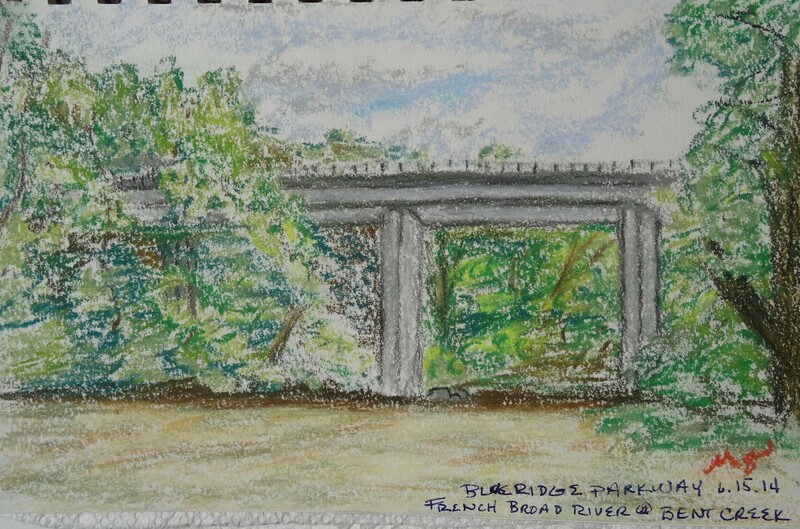 The French Broad winds through and around Asheville and is dotted with “river parks” designated as fishing, swimming, and water craft areas. Trey tried out his casting skills at two such parks but the fish were not biting those days. I took advantage of the scenery and good weather to do some sketching – something I very much enjoyed in my much younger, and less scheduled, days. We returned to Cherokee, North Carolina for the Eastern Band’s annual festival celebrating their heritage, stories, art and culture. We particularly enjoyed a story about the examples we set for our children in the way we care for aging parents, probably because it “hit close to home” for both of us. The story of why there is an Eastern Band of Cherokee is told at the museum and it describes how, after initially and legally avoiding the forced march west, the band persevered through continued removal efforts through various legal means and also by simply hiding in caves among the Smoky Mountains. Like everywhere we’ve traveled and will visit, the Asheville area is not short of amazing local fare. 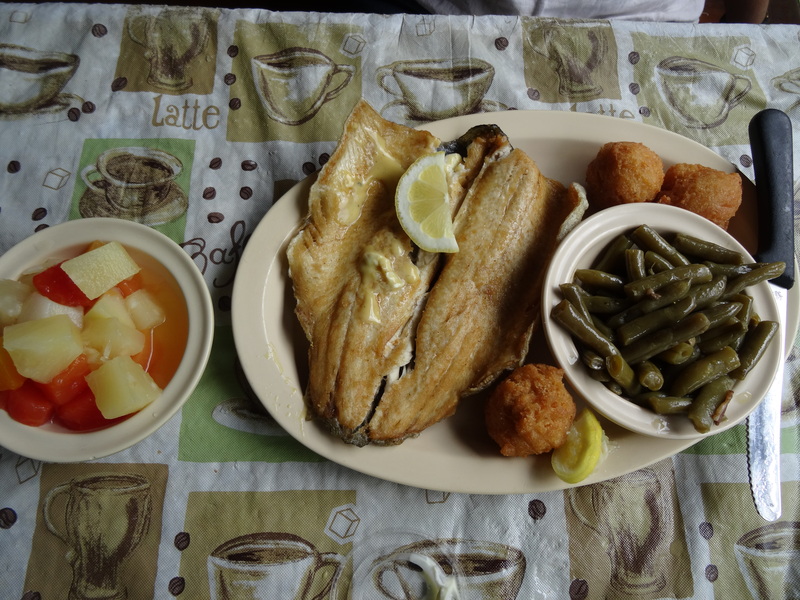 The Everett Street diner was relegated to second best breakfast since New Orleans on Father’s Day when, at the recommendation of a friend, we brunched at the Stoney Knob Café in Weaverville. Our delightful server at Stoney Knob, Emily, elaborated on President Obama’s plans — she had heard that not only is he moving to Asheville, but that he also plans to follow his passion for craft beer by opening a brewery. 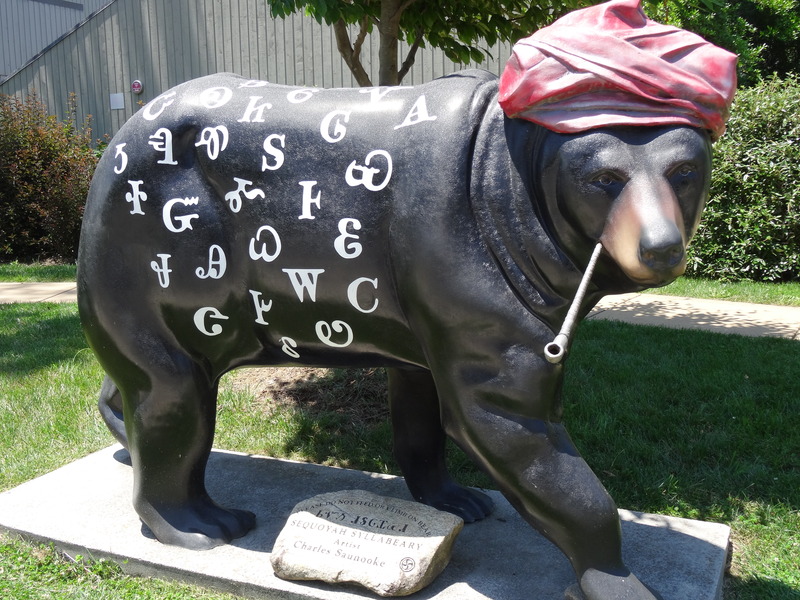 We also enjoyed Tupelo Honey Café in Hendersonville, a streamside lunch at Genny’s Family Restaurant in Chimney Rock Village, and paninis and cherry pie at the West End Bakery in West Asheville. Trey took some time on his own to play golf on Father’s day at a municipal course close to where we were staying. 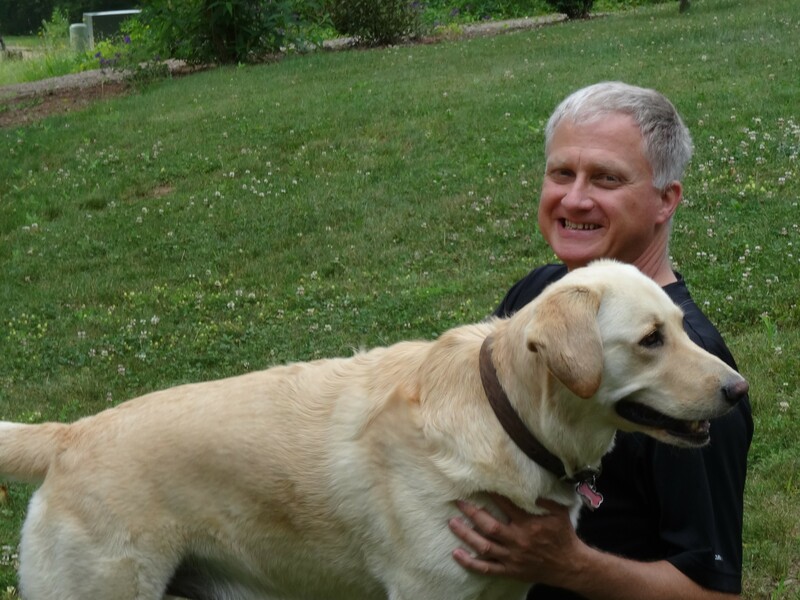 He reported that the course is well laid out and a fun course with a challenging back 9, but he was particularly impressed with the price – a total of $64 for the green fee, clubs, a cart, 5 balls, a bag of tees, and a golf glove. We thoroughly enjoyed our week in the Asheville area and left it with the feeling that it is a community that offers everything we think we’ll be seeking after our travels, with one notable exception — family. When I first read this I selfishly thought “They can’t leave Austin, we enjoy seeing them too much when we are over there,” and then I thought “Hey, if they do move to NC that is somewhere we have never been, that would be a good reason to go.” Enjoyed reading your blog very much, keep up the good work and we will see you somewhere, sometime. Sam and Hilary. We will hopefully see you and Hilary next Spring in Devon! We plan to head to England in April.